The Series Pulse Riders offer premium signal integrity, with the easiest to use touch screen display interface. The output voltage can be adjusted from 0 to 5 Volts with less than 70 ps smooth transitions time with minimal overshoot and ringing. (Rider FastEdge™). Pulse Rider includes the most ergonomic user interface on the pulse gen. market, which allows users to generate pulses quickly by a few screen touches. 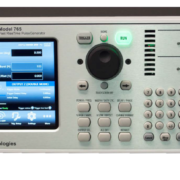 The 7” touch screen display makes extremely easy to define pulses for your application by offering a complementary soft keyboard and a useful central knob for fine-tuning and adjustments during the set up operation. Configurations may be stored on the system memory for easy configuration recalls. (USB also provided for personalized usage on Big Physics Experiments or Military Sonar/Radar applications). Multiple channel pulse generation is always available with the basic Dual Channel version or with the Quad Channels version. Each channel generate pulses with edges faster than 70 ps with frequency repetition rate from mHz to 60 MHz. The Quad Channel model can reach up to 240 MHz by combining four output channels. The new family of Rider Pulse Generator can produce multiple-channels of independent widths and delays data outputs and/or signal polarities. This may be used as digital delay generators in synchronizing, delaying, gating and triggering multiple devices with respect to one unique event. The output channels can be combined in order to have a double pulse (quad pulse in the 4 channel version) generation. Trigger events may be generated internally or capture by external trigger input or remotely from Ethernet or GBIP connections. The trigger output may be delayed according to the application, thanks to RiderEdge technology, amplified to increase the dynamic from small signals inputs. Trigger in and Trigger out may be used to sync multiple units to obtain several pulses and provide a perfect solution for specifics application in Big Physics or Military application. The large dynamic range combined with the fast edge rate represents an excellent solution for semiconductor validation as well. Physics applications may be a perfect fit for our Rider Series, even more for Pulse Rider Generator. The combination of fast edge generation, excellent dynamic range and easy to use approach will meet perfectly on large experiments areas such Experiments colliders, Lasers modulation, detectors and strips silicon emulation. High Energy/Voltage Semiconductors system for collider’s applications may be modulated and tested thanks to the Pulse Rider patterns. Lasers applied for Plasma Physics experiments may require pulses faster than 100 ps. There are several large experiments where Pulse Rider may be the perfect solution to combine high-speed transition time with high channels density (4 channel in just 3U – 19” rackmount). Pulses may be also used in mass spectroscopy applications to test TOF (time of flight) systems and in chemistry application to easily prove functionality. Army/Navy may also require fast pulse generation for testing or emulation. Radar or Sonar system are perfect fits for these generators to better test and prove complex detection systems. Pulse Rider is a good fit in areas where a large amount of channels is required and cost of DAC solution are too high and too complex to be managed. ATI Electromagnetic systems largely used on military applications, may be tested by Rider Series Generators. Pulse may be easily generated for application such Pulse Electron Beam or X Ray Sources, Flash X-ray Radiography, Lighting pulse simulators, high Power Microwave modulators. Speed of modern Silicon is imposing high quality and highly fidelity test systems. 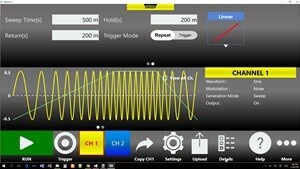 Today patterns generators offer a good combination of performance but limited in edge speed and dynamic range . Pulse Rider, first time on the market, offer both speed and dynamic range, combined with an easy to use interface, to provide pulses mixing capabilities in one or multiple channels. This is excellent to test components and provide a good quality of performance to test and prove specs to be used to validate chips. DTG functionality may be created by syncing one or more Pulse Riders units (4 Channels each). 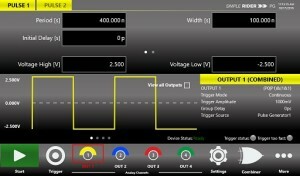 The Rider series offers also, on the AWGs and AFGs, digital outputs to be used for external digital pattern emulations. 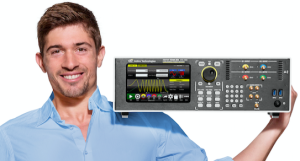 This new Rider Series™ of Bench top instruments is targeting a broad range of electronics applications from the Automotive and Power Electronics market to the Physics and Defence Electronics applications. 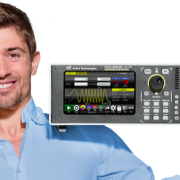 This family of new products offer a unique combination of pristine signal output quality, high channel count and lower cost per channel than other more expensive solutions already present in the Test and Measurement market today. 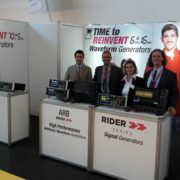 The Riders AFGs and Rider AWGs series will be based on a Worldwide best performance high resolution Digital to Analog Converter (RiderDAC™), that meets the market demand for high sample rate, dynamic range and very deep generation memory, combined in a very reliable and complete solution. 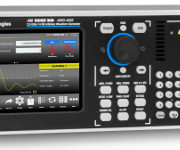 All Rider™ AFG, AWG and Pulse Generators, will be released with a new easy-to-use software Graphical User Interface and ergonomic front panel, 7 inch touch screen color display and optional 3U – 19 inch rack mounting solution in a 2 or 4 channels configuration with the possibility to synchronize multiple instruments to achieve an higher channel count. All products will be released at the shows in Munich and we will start quoting immediately after the event. Technology such RiderDAC™ , RiderFE™ and RiderSimple ™ are registered trademark of Active Technologies, Ferrara, Italy.